The Granite section is now laid and can't be changed effortlessly. This implies your measured kitchen configuration cannot be a modular one. There are various other restrictions because of the civil issues like beams, pillars, slant walls etc. It is better to understand the modular kitchen design and implementation fully before visualising your own kitchen based on the research from the internet and other international interior design magazine. The following are a set of tips which helps us to understand various aspects of the kitchen. The optimal number of the baskets and pull outs have to be planned. They provide better organisation and efficient storage. Having a false partitioning below the sink to help store the detergents and other washing materials. The open shelves can be used to access frequently used things which makes it more efficient and also aesthetically pleasing. 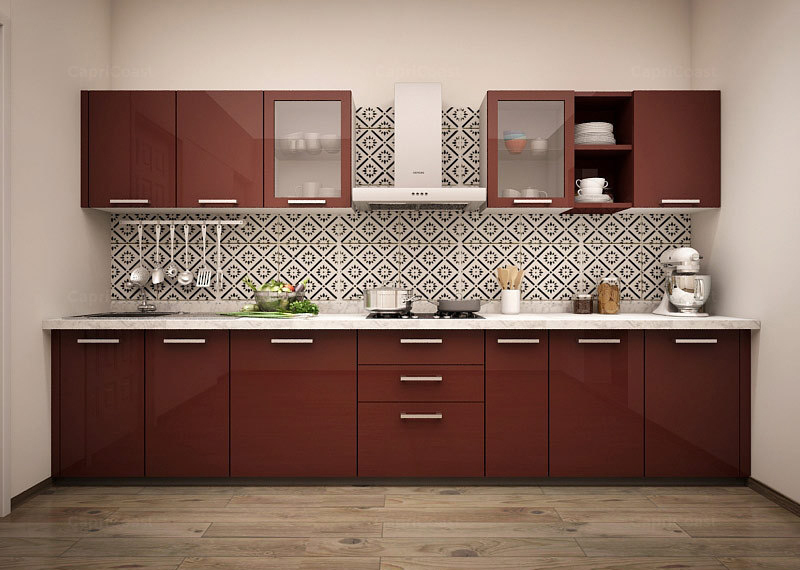 If you are on a budget, then the steel modular kitchen can be implemented which increases the longevity. It’ll also be an easy to clean kitchen. Using a uniform color scheme for the kitchen is the modern approach. Using alternate colors have become an obsolete trend. To have an even more trendier look, we can try having frosted glass doors for a few floor units. The handles can change the looks of the kitchen. Longer handles will give a richer look, curved handles will give a postformed look whereas square handles will give a regular look.